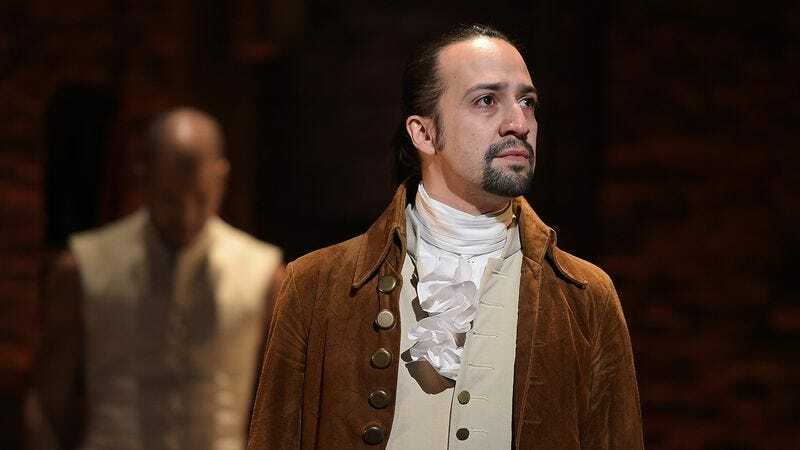 Lin-Manuel Miranda’s initial concept had many of the Hamilton characters we know and love today, but with a completely different plot line that left audiences in tears. Goodnight, Father tells the story of Aaron Burr killing each of America’s Founding Fathers one by one with a baseball bat to prove that he is the strongest of them all. In the show’s gut-wrenching finale, Burr sings, “America, forgive me for my heinous crime / But I hereby declare this our nation’s pastime.” He then clubs George Washington, John Adams, and Alexander Hamilton to death with his wooden bat. The show debuted to rave reviews in New York, but Miranda ultimately decided to end its run so he could workshop the idea further. To Burr And Back tells the story of Aaron Burr and Alexander Hamilton in the earliest days of their career, as an inseparable pair of best friends rising up through the ranks of 1790s American politics. When Aaron has a vision that someday he and Hamilton will engage in a duel, he decides to build a time machine, transport himself back 40 years to 1756, and kill his younger self to keep Hamilton out of harm’s way. By the final number, “The Baby That Is Me,” there wasn’t a dry eye in the house. But Miranda—ever the perfectionist—still wasn’t satisfied. Lin-Manuel’s next few revisions did away with the Hamilton character entirely, to focus more on Aaron Burr and his capacity to kill. The Swamps Of Eden was a hip-hop retelling of the story of Adam and Eve, with a brand-new ending that had audiences leaping to their feet with applause. After Eve tastes the forbidden fruit, God enters the stage and raps, “I just had a vision / To make a man named Aaron Burr / And since Eve wouldn’t listen / He’s allowed to kill her.” Aaron Burr then appears in a cloud of smoke, draws his gun, and riddles Adam and Eve with bullets, and the play abruptly ends. Despite receiving standing ovations every single night of its two-week run, Miranda went back to the drawing board. Miranda’s fourth rewrite transported the entire Burr family to 1950s Nashville, where single mother Mama Burr has entered a local dance competition for a chance to win $500. When Li’l Aaron learns that his mother will be competing against Dale Huxby, the only man in town who can do a backflip, Aaron faces the toughest choice of his life: Either teach his mother how to do an equally impressive trick, or garrote Dale Huxby with an ox collar on the family farm. Li’l Aaron chooses the latter, and his mother takes home the grand prize by default. The play was later adapted into 2013’s Pacific Rim. The show’s next incarnation was Stayin’ Alive!, a jukebox musical that used The Bee Gees’ greatest hits to tell the story of Aaron Burr trying to kill everyone at a discotheque. The Bee Gees immediately sued, and Miranda later told The New York Times that he was glad the project was canned, as it helped him realize that he needed to bring the project back to its roots—a show committed to telling important stories from American history. Vice President Aaron Burr has it all: a loving wife, a beautiful home, and the second-highest job in American government. Enter Pussywillow, a back-talking tomcat with a fondness for sleeping on Burr’s prized petunias. The resulting two-hour musical romp follows the back-and-forth hijinks of the pair, as Burr repeatedly nabs Pussywillow and slits his throat with a hunting knife, only to have the cat reincarnate himself into Alexander Hamilton right on the White House lawn. Miranda reportedly turned down three separate offers to take Pussywillow to Broadway, as he still felt the script needed a final revision. The Duel was virtually identical to today’s version of Hamilton, save for the final face-off between Hamilton and Burr. Burr fires his pistol—but instead of killing his opponent, the bullet just barely grazes Hamilton’s ear before ricocheting off the Liberty Bell and coming back to strike Burr himself straight through the head. The ensemble then slowly gathers around Burr’s corpse for a heartbreaking final number, “There’s A Crack In The Bell.” The show won two Drama Desk Awards and an Obie, and after a few final tweaks to the ending, Hamilton was ready to take Broadway by storm. The rest is history.